I added on the 1st post the result+replay and some pics of the race. Very good race, it was very funny. Congratulations to the podium and hopefully not fall much in the next haha. See you at the next. sorry, thanks for letting us know, was a mistake, sorry. I had core exe at 2nd last lap or my comp froze, one of the two. I enjoyed the race, however in the begining of the race, all bikes infront of me expect a few were invisible, could't see them and then i crashed. The pics are just fine Loopa. Nice job mate! I had a good race considering the pile-up on the first corner I was involved in which left me at the back of the field. Someone(I don't know who?) came right up the inside and hit me causing a right old pile-up. Sorry for the other two or three guys I knocked off in the resulting mayhem....... Racing accidents happen I guess. 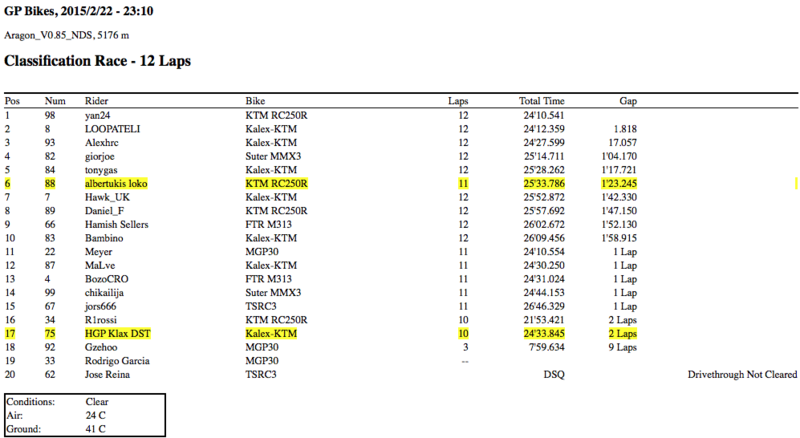 Apart from that I had a good race overall though I was certainly not on the leading race pace at all.... I've still got to get the hang of these 250's(250's!! Really! Lol); a totally different riding style needed altogether for these bikes, they are SO gutless(more like a 125 engine. ) but much fun at the same time!! Hehe. Congrats to Yan for the win... Well done mate! Great race and great start to the Moto 3 Champs season guys.... Looking forward to the next one. As we receive a claim due to missing of laps and timing issues, we took a look to the race analysis lap times as well as to the replays.